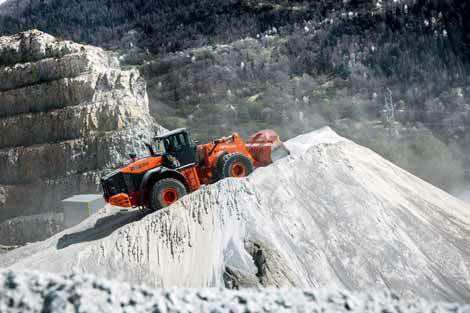 The Colas Group has invested in a new Hitachi ZW330-5 wheel loader for its Socavi limestone quarry in Savoie, in the Rhône- Alpes region of France. The quarry in Commune de Villette, near Moûtiers, produces 200,000 tonnes of aggregates per year, which are predominantly used for construction and public works. Since it arrived on site in July 2013, the ZW330-5 has been used for transporting the limestone materials, reshaping stockpiles and loading trucks. Approximately 70% of the material is allocated to Socavi’s customers, which are largely public works contractors. Delivered by local dealer Teramat, the Hitachi wheel loader has a three-year/5,000-hour Hitachi Extended Life Program (HELP) warranty, which includes the supply of Hitachi Parts. Colas decided to invest in the new machine following a positive experience with Teramat’s after-sales support team. In terms of performance, Ougier feels he can use the Hitachi ZW330-5 without compromise, even when fully loaded and travelling up steep inclines. “The high breakout force enables me to fill the bucket easily,” he explains.